o How to find them by rearranging in standard form. able to recognize them and work with them in order so solve equations and graph functions. You already met these in chapter 5. for example. equations and graphing quadratic functions. right constant by halving the coefficient of x and then squaring it. that we don’t mess it up. Solution: First factor the coefficient of x2 out of both the x2 and x2 terms. o We now have Completing the square- see below. gives us one messy formula for the answer. See below. Example: Solve the equation x2 +10x − 3 = 0 by completing the square. Now, complete the square, but don’t forget to add the same thing to both sides. o No real solutions, but two complex solutions. 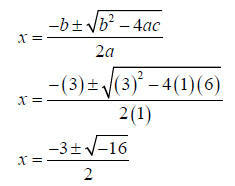 This is made clearer by the quadratic formula which we do next. sounds simple, but there are two frequent errors. into your calculator as once. Start with the radicand first, and store it (or write it down). “discriminates” or sorts out the different types of solution you can get. o If b2 − 4ac is zero, the equation has one real solution. o If b2 − 4ac is negative, the equation has two complex solutions. 2. Find the solution or solutions, and write them in simplest form. you also find the y co-ordinate is -7. So the lowest point of the graph is (-2,7). the axis of symmetry is easy to get once you have the vertex – you just use the x co-ordinate. Since h=2 and k=4, the vertex is at (2,4). Also since a is -3 which is negative, it’s a hill. Here’s an example where we’ll rearrange the function. determine the vertex, axis of symmetry, and the overall shape. Solution: We rearrange by completing the square. First factor the 2 out of just the x2 and x terms. That’s it from me! Hope this helps.